Fresh cherry tomatoes picked straight from the plant are one of summer’s greatest pleasures—partly because they’re so tasty and sweet, but also because a serving provides ½ your daily requirements of Vitamin C. Toss them into this zesty Southwest salad for a simple and healthy meal at home or a stand-out side dish at your next backyard barbeque! Bring a medium pot of water to a boil. Add corn and cook for one minute. Immediately remove from heat and drain. Set corn aside. 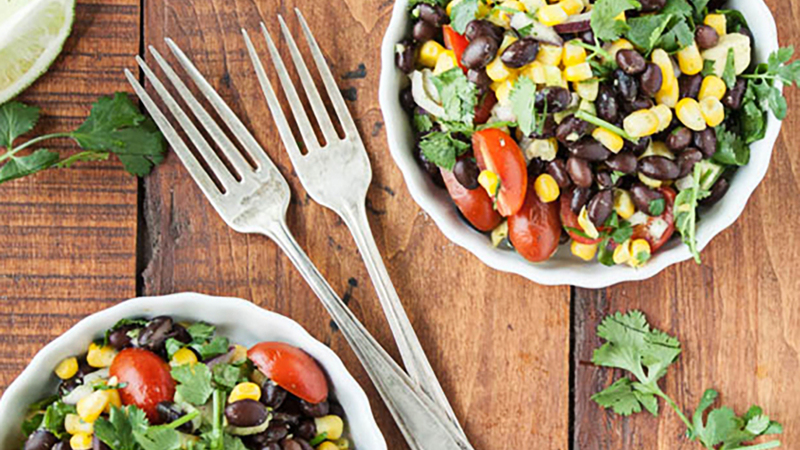 In a large bowl, toss together the beans, corn, tomatoes, avocado, onion, ¾ cup cilantro, and ¼ tsp. red-pepper flakes. Place lime juice, garlic, honey, 2 Tbs. cilantro, and ⅛ tsp. red-pepper flakes in a food processor. Begin to process and slowly drizzle in the olive oil with the motor still running. Taste, add salt and pepper to taste. Drizzle over salad and toss until evenly coated. Serve at room temperature or chilled. This looks delicious! Is there a way to “favorite” recipes or somehow save them in a personal recipe index so we can easily access them? Not ready to make this right now, but don’t want o forget about it down the road! Thanks! We do not have a “favorites” button but you can email and print out the recipe (located under the ingredients). All of the recipes remain online under the B3 Magazine and are sorted by meal. I can’t wait to try this! What would be a good substitute for tomatoes? Bell peppers are rich in Vitamin C and would be a delicious substitute. Let us know what you think! I love how easy this was to make and that it was packed with protein and fiber. I found the red onions to be a little overpowering (especially at the office). I think next time I might substitute shallots. Has anyone seen how long this will hold up in the fridge? It’d be great to save it for lunches, and since there’s not really lettuce in there I’m hopeful. A week is usually a safe bet on leftovers- hopefully you were able to save some for lunches! How many calories does each serving have? Fantastic!!!!! This is my new go to side dish for any event!! Any chance you can make these recipes so I can pin them? Great idea, Kimberly! In the meantime, you can pin our recipes using the “add from website” tool in your Pinterest account. Most of our recipes are only viewable to those who have active accounts, so you’ll want to be logged into your barre3 account when going to the recipes from Pinterest. Mmmmmm! The sweet corn is a great complement to the zesty dressing. (I will definitely make this dressing for other salads, too!) I enjoyed this over spinach to get in some extra greens. 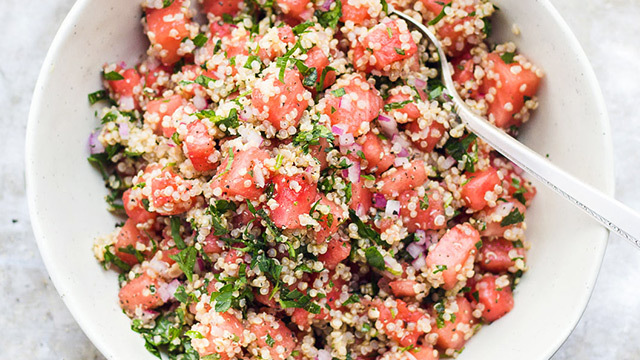 I haven’t added quinoa, but I think it would be great! Love this salad..added the left-overs to our breakfast burritos this morning…yum! Has anyone tried adding quinoa to this recipe?